Cappadocia has a unique atmosphere that impresses people. 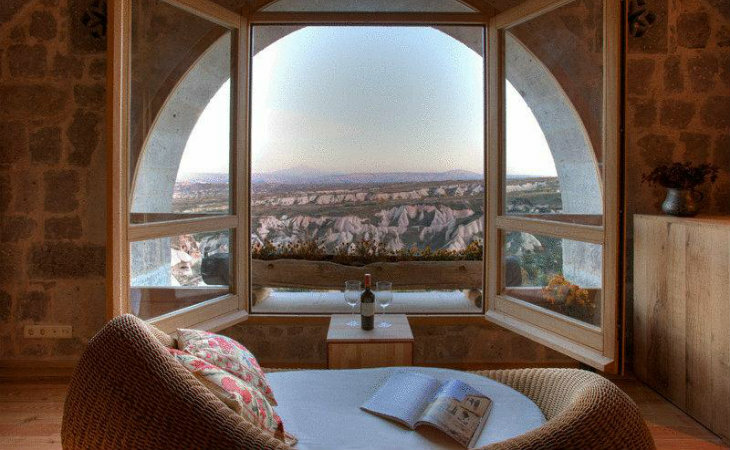 The perfect way to start the day is through Argos in Cappadocia Hotel. Located in Uçhisar, the hotel offers breathtaking views of Mount Güvercinlik and Mount Erciyes. Waiting for their guests at the old Uçhisar Village, Cappadocia Argos Hotel is close to thousands of years old monasteries, underground tunnels and caves full of mystery. 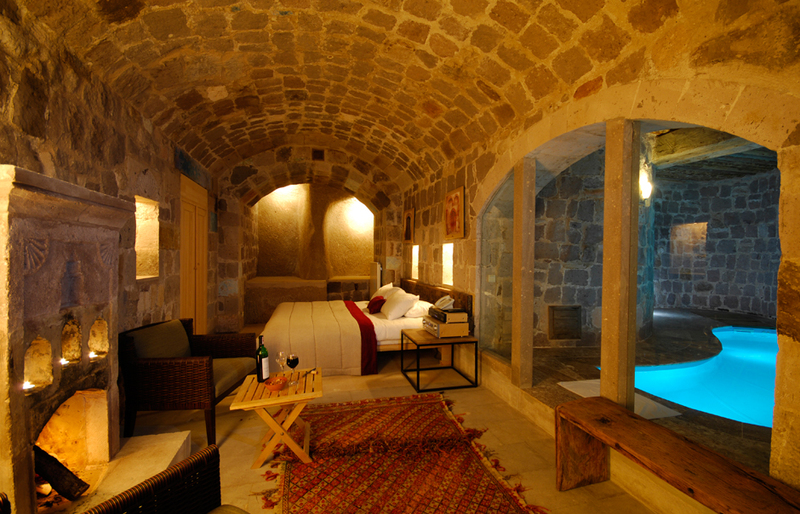 Thanks to Cappadocia Argos Hotel, it is not a dream to experience a comfortable stay in historical beauties. 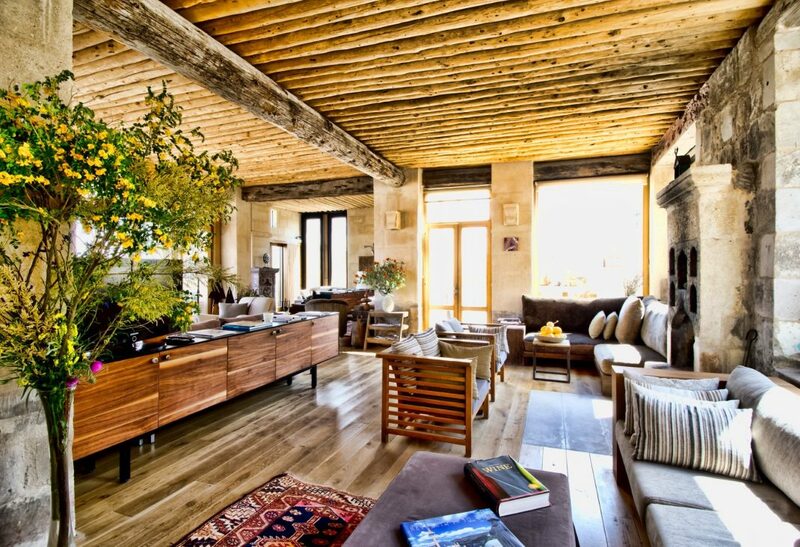 Argos in Cappadocia Hotel, which offers a distinct beauty at all levels, consists of 7 mansions. These mansions, which fascinate their guests, have 51 rooms in total. Argos in Cappadocia Hotel welcomes more guests than the number of rooms. The atmosphere of each room is unique. You can also come across antique-like items in this hotel where local trails greet you in every corner. Collected subterranean artifacts from all over Anatolia, hand-woven rugs and items of centuries of history can take you to the dusty pages of history as soon as you see. Cappadocia Argos Hotel, which is very sensitive in the choice of furniture, offers the masterpieces of stone, iron and carpenter masters to our valued customers. Cappadocia Argos Hotel which is a 2-minute walk from Uçhisar Castle, makes your trip easier. The hotel has a conference center, you can easily organize business trips as you wish, and have a peaceful accommodation in the evening. Free bicycle rental service, you can make bicycle tours with your loved ones as you like, you can enjoy the taste of Uçhisar. Please contact the hotel staff in order to benefit from the airport transfers offered by the Cappadocia Argos Hotel. Thanks to this transfer service, you can easily reach your hotel. You can enjoy your evening meals at the Argos Hotel in Cappadocia, which has a unique concept, and you can enjoy your drinks in the hotel’s garden. Also considering families with children, Cappadocia Argos Hotel offers babysitting services for its guests. The fact that there are side rooms that are connected to the families is a huge advantage. You can reward yourself by requesting room service in the Cappadocia Argos Hotel where daily housekeeping is perfect. Free on-site parking is available, and you are free to enjoy unlimited internet access. Thanks to the 24-hour reception, you have the opportunity to find answers to your questions at any time of the day. With its mansions, monasteries, Tunel, Vasil, Gemil, Beyaz, Traz and Kavak, you can choose the all-inclusive accommodation option at Cappadocia Argos Hotel and make your holiday without thinking about all the details. Each mansion has beautiful rock, suites, deluxe, splendid suite rooms. You can choose your room according to your needs. Only 2 minutes from Uçhisar Castle, Cappadocia Argos Hotel is located in Uçhisar area of Cappadocia and is a 10-minute walk from Güvercinlik Valley. You can evaluate various alternatives to get to Uçhisar area on Nevşehir and Göreme road. 7 km east of Nevşehir, 12 km west of Ürgüp and 10 kilometers south of Avanos, you can evaluate different alternatives to get to Uçhisar area. You can visit the beautiful fairy chimneys of Cappadocia. If you are going to be transported by bus, many companies have direct services to Nevşehir. You can complete your journey without looking for other vehicles by choosing these flights. After arriving at Nevşehir terminal, you can use the minibuses that move in half an hour or forty-five minutes to get to Uçhisar. When you come to the Uçhisar area, you can reach Cappadocia Argos Hotel by walking 10 meters from the castle street and coming to Göreme Street. You can enter Argos in Cappadocia Hotel, which will allow you to spend a pleasant holiday by crossing the Kayabaş street after you have moved a little further from Göreme Street. If you are away from Nevşehir, or if you don’t want to spend time on the road, you can choose to travel by air. Argos in Cappadocia Hotel offers a comfortable transfer to and from the airport. There are 2 nearest airports to Cappadocia. If you wish, you can choose the airport in Kayseri or the airport in Nevşehir. Access to the region from both airports is quite easy. The fact that Cappadocia is among the most visited places also provides a variety of transportation networks. If you want to come to the region with your own vehicle, you can reach to Uçhisar in 1 hour from Kayseri, 8 hours from Istanbul, 3 hours from Ankara, 7 hours from Bursa and 9 hours from Izmir. After logging into the Uçhisar area, it is enough to come to Kayabaşı Street. Cappadocia Argos Hotel is located very close to Uçhisar Castle and you can follow the directions to the castle. You can choose Cappadocia Argos Hotel to experience the beautiful moments of Cappadocia. Cappadocia Argos Hotel, which knows what each guest may need, offers its services in this direction. From families to honeymooners, everyone can add this hotel to the holiday plan with peace of mind. Pricing also varies according to the needs and the number of people needed. Cappadocia Argos Hotel, which has the advantage of having 51 rooms, has extremely high equipment in its rooms. You can choose 2-person accommodation options, or you can request extra beds for your child. It is also possible to make all the members of your family comfortable by choosing the connecting rooms. Each of the rock, deluxe and suite rooms have a different price. The price of one-night accommodation in Cappadocia Argos Hotel is from 150 Euros to 300 Euros. You can make your selections according to your budget. Please note that rooms in the season may have higher prices. You can take advantage of early booking opportunities to spend a more advantageous holiday. You can book your place in Cappadocia Argos Hotel to enjoy your morning coffee with the chirping of the birds, to witness the plateaus of Cappadocia and to feel the breeze of Mount Erciyes. Cappadocia, which makes you feel at home, is possible thanks to Argos Hotel. 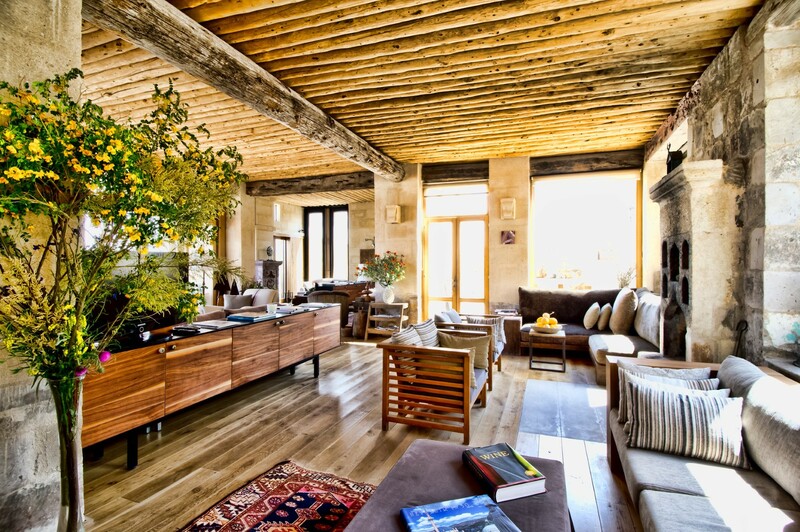 The location and architecture of Cappadocia Argos Hotel makes every step you turn into a feast. From the rooms to the gardens and terraces, you can feel the deepest in every detail. Cappadocia Argos Hotel offers an excellent opportunity for you to look at Başhisar and Ortahisar from the hill and look at the Güvercinlik Valley. You can stay away from the problems that will reduce your energy with the friendly team and the sensitivity they show in cleaning. It is very easy to find tastes that are suitable for your taste. You should definitely not leave Cappadocia without tasting the wines obtained from the vineyards of Argos Hotel. With your loved ones you can watch the Cappadocia with a glass of wine on the terrace of Argos Hotel and feel the peace in every corner of your heart.